Thomas, a junior, sent the shot soaring 46-1, a PR of nearly four feet, to shatter the meet and Camden County record and take over the state lead. The former SJ sectional record of 44-9.75 was set in 2017 by Najeaya Singleton of Vineland. The 46-1 by Thomas is more than three feet further than the No. 2 thrower in the state, Howell sophomore Bryanna Wilson of Howell (42-7), and is the top high school mark in the U.S. by an underclassman. In the girls team competition, Collingswood rolled up 110 points to outscore runner-up Audubon by 59 points. 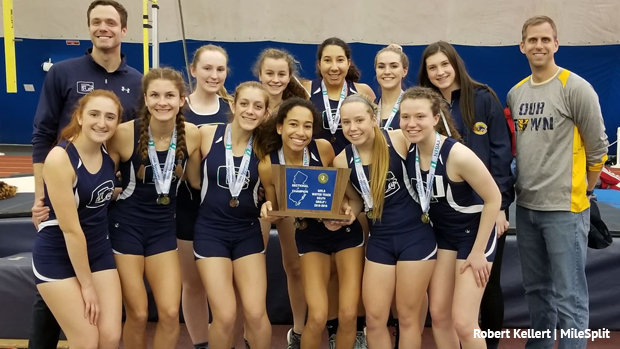 Collingswood was led by double winner Sophie Steidle, Samantha Hamrick, and Emily Wallace. Several other athletes contributed to Collingswood's victory. Quinn Basewitz was second in both the 1,600 (5:40.86) and 3,200 (12:27.87), and was fourth in the 800. Dash Cruz was third in the dash and fourth in the 400. Deriana Bryant was second in the shot put, Hailey Spencer placed fifth in the shot, and Josie Cook and Emily Waldron went 5-6 in the pole vault. 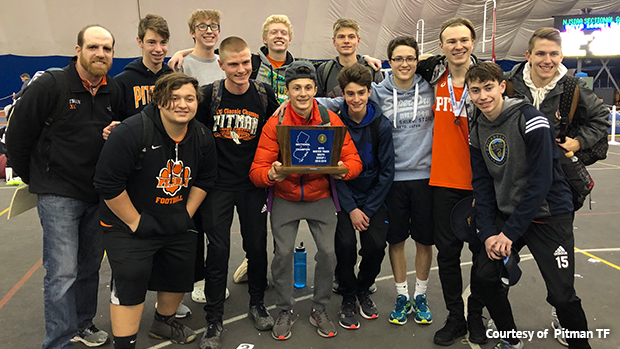 In the boys competition, Pitman relied on its strong distance running to outscore runner-up Woodbury, 50-42, for its first title ever. Senior Anthony Razze and junior Sebastien Reed combined for 36 points for the Panthers. Razze won the 1,600 in 4:31.32 with Reed coming in right behind him in second in 4:33.43. In the 3,200, Reed was first in 9:59.41, and Razze second in 10:07.79. Freshman Cole Sharpnack (2:02.87) finished second in the 800 for Pitman, and the 4x400 team placed fourth.